Discover some very simple dining room decorating ideas to do up your abode. 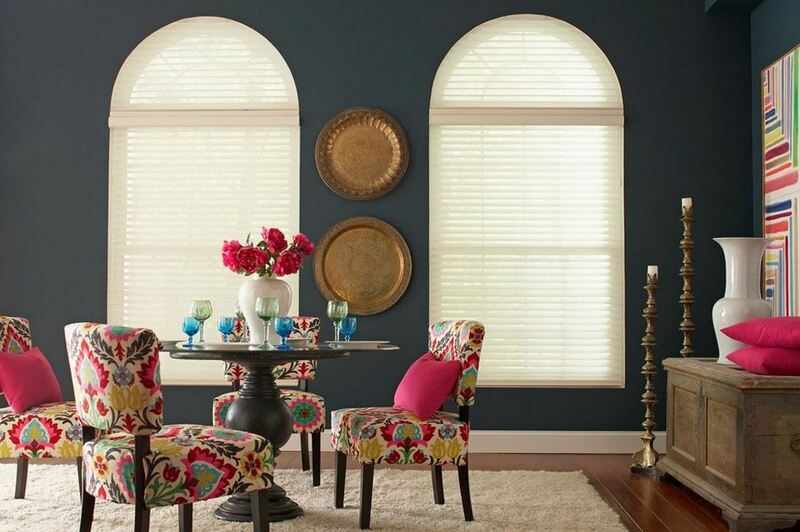 These decor tips can enhance the beauty and style quotient of your dining room. Dining room is a place where family and friends gather together to enjoy meals. It’s imperative to give a cozy and luxurious ambience to the guests so that they are able to enjoy every moment of togetherness. Here is a classic modern dining room. Use table lamps to decorate your dining room. You can find an array of lamps available in the market. Another striking feature is the mirror behind the console table; it adds more to the style. The patterned rug is in sync with the dark tone dining table. Every element in this dining room speaks of its chic, style and elegance. Add huge glass windows to your dining room to enhance its look. The city life outside magnifies the glamorous interior. I love those mismatched dining room chairs and the candle stands. The bejeweled chandelier looks out of the world! 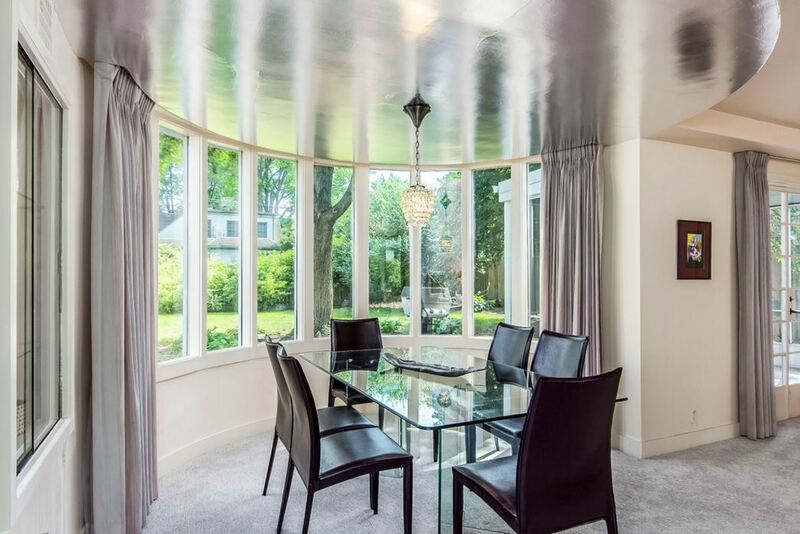 Such ceiling treatment in dining room decorating ideas paves way for novel concepts. Give a personalized touch to the ceiling for a unique look. The garden view makes the environment inside pleasantly cool and green. The simple and straight lined dining table looks smart. The dining room decorating ideas like these shares the freedom to play with lights. Another factor that you can add to draw attention is the floor lamps with the chequered piece of art mounted in the centre. Floor lamps look equally elegant when it comes to decoration. The plush chairs coupled with the dark brown dining table looks exotic. I love the uniqueness of the concept! The royal blue tone gives an aristocratic look to the area and adding more to it is the fur bench. You can experiment with the look by going for a bench of your choice. The Victorian chandelier along with the artifact kept on the console table maximizes the royal touch. 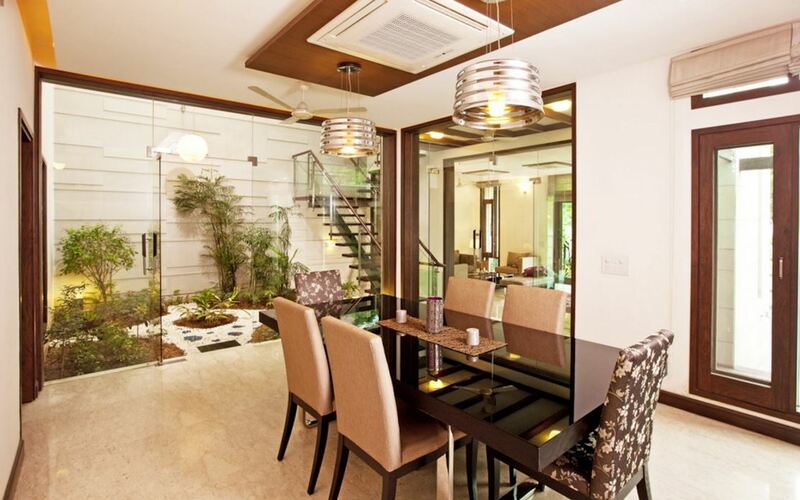 This beautiful dining room looks fascinating owing to the beautiful garden area. Creating an indoor or outdoor garden area just beside your dining space is a brilliant idea. The glass panels around make the room look more spacious. The floral upholstered chairs teamed with plain beige ones give a fresh bent to the dining room decorating ideas. Take a look at this eco-friendly dining table that provides warmth and a bit of style to the dining space. The wooden table with white-painted chairs against the bright wallpaper looks flashy yet adorable. 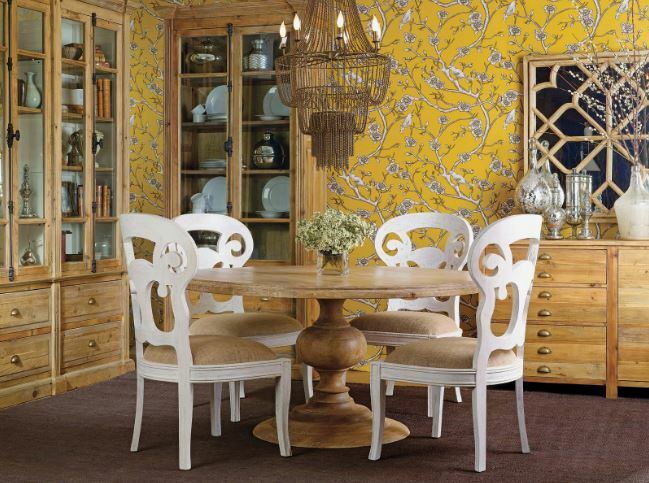 Use wallpaper to decorate or revamp your dining room. The lovely chandelier and the console add grace to the ambience. Feel the breezy look in dining room decorating ideas that have sheer curtains. They give a dreamy romantic ambience to any room. Sheer curtains are simply the right choice for huge windows and sliding doors. 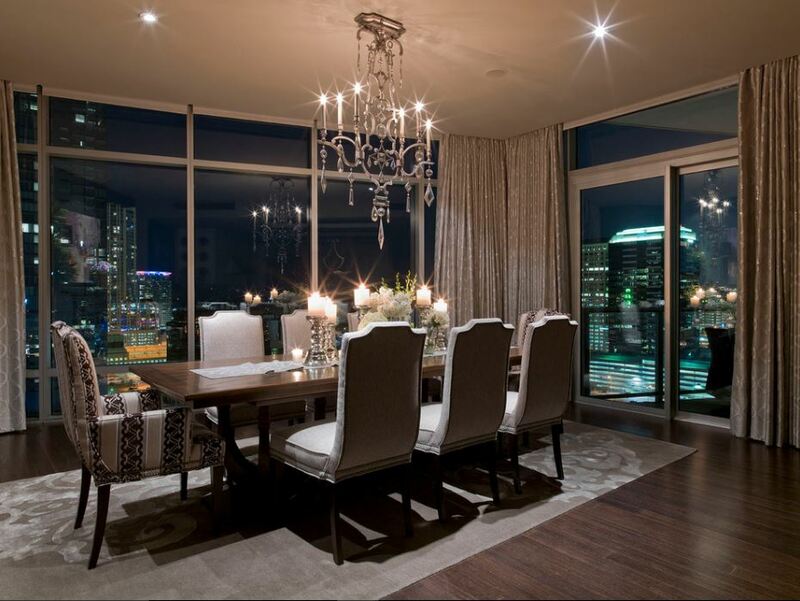 The dining set teamed with the beautiful pendant lamps is a jaw dropping display. Don’t forget to add a dining table centerpiece decor. You can choose flowers, figurines, candles and many more things as decoration. This dining room flaunts wooden and traditional dining furniture. The open area extension allows the nature to take a peek in. The piece of art on the wall looks awesome. Check out this fresh lime green dining area! Design open storage shelves and display your chinaware on it. This will take your dining room decor to another level. Lovely combination of the color tones reflects to the quiet and balanced personality of the owner. 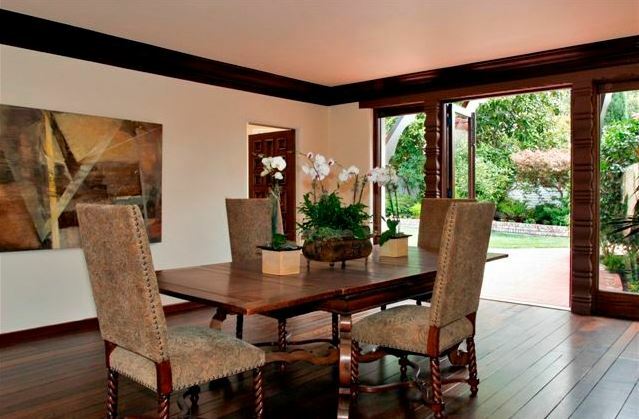 The wooden flooring adds charisma to this amazing dining room. The dark wood dining table placed on textured flooring is indeed ingenious and simple. The mesmerizing ornamental mirror amplifies charm and grace of the room. Keep in mind whether you have a modern, traditional, contemporary, Mediterranean or a craftsman dining room and choose a mirror that matches your style. Dining areas as such are exemplary of exotic dining room decorating ideas. Add color to it by way of furniture and accessories. The colorful upholstery in here is one of a kind and takes the decor to another level. The antique floor candle stand alongside the tarnished console table extends a royal feeling. And, the brass plates on the wall further accentuating it. 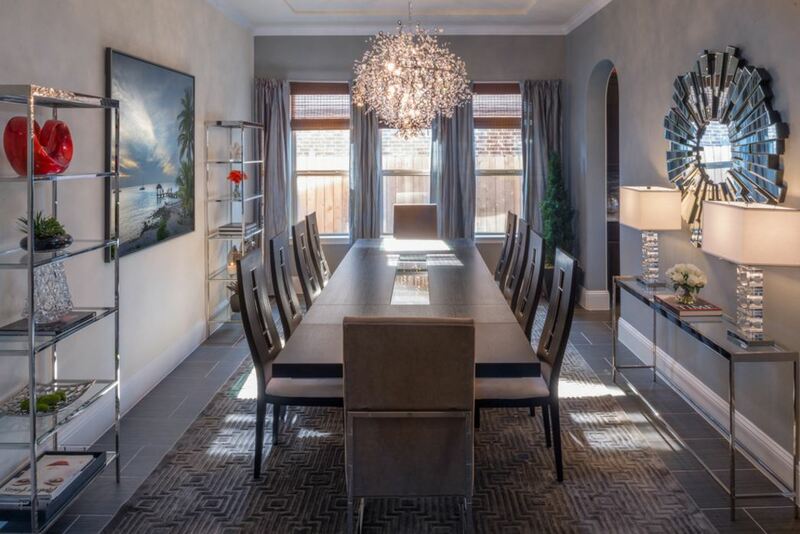 Take a look at this large dining room area with simple, smart and elegant furniture. The artwork on the wall makes the room look graceful. 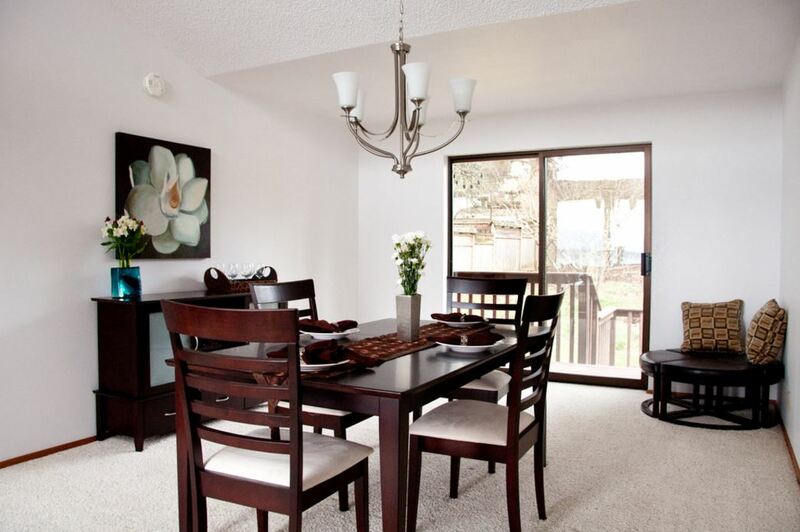 This dining area has lots of sunlight surging in, which in turn is the harbinger of positiveness and happiness. This dining room epitomizes elegance and style. Decorate the dining room by adding a gorgeous light fixture. 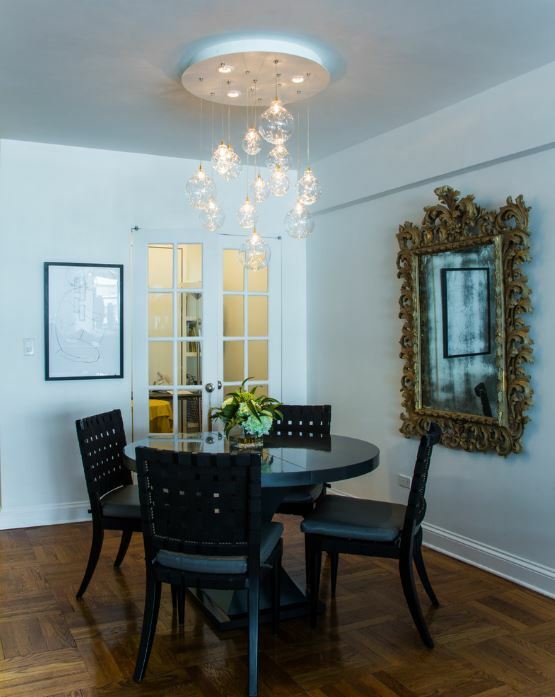 Go for traditional chandeliers, modern pendant light or custom-made pieces. You will find a wide variety of light fixtures available in the market. I love the glossy glass tile floor and the matching dining table. Check out this wonderful modern design of the dining table set. The fur rug looks stylish and so does the smooth wooden flooring. Decorate your dining room with rugs and carpets; they add texture and warmth. The sumptuous green apples accentuates an energetic aura around in the atmosphere. This entry was posted in Dining Room, Dining Room Designs and tagged Beautiful Centerpieces for Dining Room Table, Dining Room, Dining Room Colors, Dining Room Decor India, Dining Room Decorating, Dining Room Decorating Ideas, Dining Room Decorating Ideas on a Budget, Dining Room Decorating Ideas Traditional, Dining Room Design, Dining Room Design Ideas, Dining Room Designs, Dining Room Designs Pictures, Dining Room Ideas, Dining Room Wall Art, Dining Room Wall Decor, Small Dining Room Decorating by Preeti Sinha. Bookmark the permalink.